China and Russia should strengthen their strategic partnership and interaction across the board to protect their own interests and international peace, says Chinese leader Hu Jintao. ­Although never directly mentioning intensifying their military cooperation, the Chinese leader’s use of the words “strategic partnership…security and stability” seems to point in that direction. 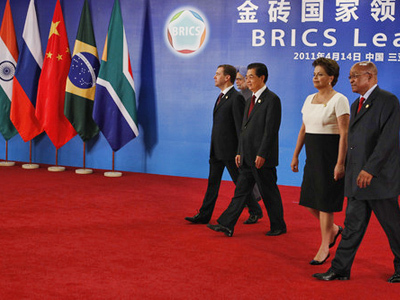 Hu Jintao met Medvedev during a formal gathering of the five-member economic bloc known as the BRICS, which is comprised of Brazil, Russia, India, China, and newly admitted South Africa. Thursday's one-day meeting in the Chinese resort city of Sanya is the group's third annual summit. 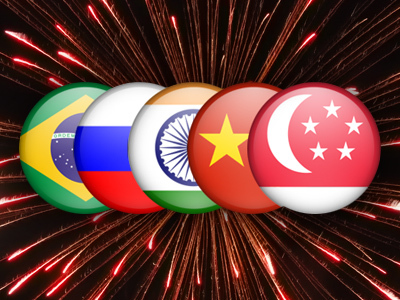 BRICS accounts for 40 per cent of the world's population, about 20 per cent of international trade and 45 per cent of total economic growth, thus giving them a greater global voice. Both China and Russia "should fully make use of their advantages and huge reserves" for broadening their relations, the Chinese leader said. Hu, noting that 2011 marks the 10th anniversary of Moscow and Beijing signing a treaty on “neighborliness, friendship and cooperation,” stressed the need "to further develop traditional friendship between the peoples of our two countries." Russia and China should "strengthen mutual political support and resolutely back each other's efforts aimed at protecting sovereignty, security and development," he said. Hu Jintao, who is overseeing a spectacular Chinese resurgence on the global stage, also expressed his communist government’s interest in "the promotion of cooperation in the construction of a Russian-Chinese western gas pipeline and other major energy facilities." Noting the turbulent dynamics of a globalized economy, Hu said Chinese-Russian cooperation was vital for "strengthening contacts and coordinating positions on the most important international and regional problems and aspects of the global financial-economic system's reform." 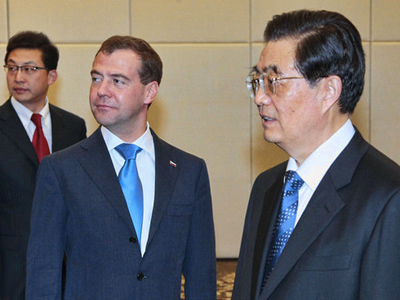 During their meeting on Wednesday, President Medvedev underlined the importance of the Chinese-Russian relationship: "Our countries are strategic. This will allow us to coordinate our policy in international relations and to develop partnership in the economy, politics and other fields." "I believe that today we will be able to take one more step towards strengthening partnership," the Russian leader emphasized. Medvedev also discussed with his Chinese counterpart the international scene, most notably the rash of popular uprisings that have swept North Africa and the Middle East. "Just like other members of BRICS, Russia is very concerned about the situation in Libya and causality of civilians. It is our shared idea that the situation in Libya could only be resolved through political and diplomatic approaches," the Russian president said. China, Russia, India and Brazil all abstained on March 17 from a United Nations Security Council vote on Resolution 1973 that authorized the air strikes. Medvedev then expressed his concern about NATO participating in the “military operation” in Libya, yet nothing was said about its participation in the resolution vote. 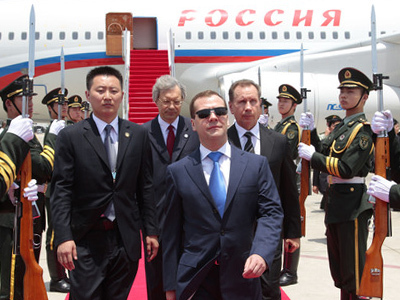 “If this situation continues, it will turn into a dangerous tendency," Medvedev warned. The Russian president also took an opportunity to mention the ongoing threat of terrorism, singling out the bomb blast in the Minsk Metro which killed 12 people and injured about 200 on Monday. "No one is shielded from terrorism by a blind wall, and now this plague has come to Belarus," Medvedev told a news conference on Thursday. "It is much easier to find the perpetrators than to understand the mechanism and find out who organized the terrorist attack and what goals they were pursuing," he said. The Russian leader added that he ordered Russia’s Federal Security Service (FSB) to assist Belarus in its investigation. On the economic front, Russia's desire to host the G20 in 2013 was confirmed on Thursday in written form for the first time. 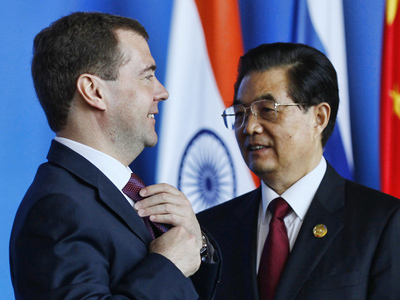 President Dmitry Medvedev officially put forth the initiative of holding the G20 meeting in 2013. The BRICS partners supported this idea. Russia is set to host the G8 Summit in 2014.